The MaxTrax Walker is designed with a wider foot bed for comfort and stability. The low profile, rocker bottom helps promote natural gait and reduce plantar pressures. Cushioned inner and outer sole provides shock absorption to help improve patient comfort during ambulation. The Maxtrax walker is recommended for use following stress fractures of the lower leg, soft tissue injuries (2nd and 3rd degree sprains), stable fractures and injuries of the foot and ankle, bunionectomies, and metatarsal fractures. Shop DonJoy walker replacement parts for additional liners, straps and covers. I have the walking boot. I have been able to hand wash the lining but haven't been able to find any care instructions for the foam in the sole of the boot. It doesn't come out so how can I clean it to get rid of the smell? Without removing the foam you can wash it with mild detergent on a wash cloth. Rinse the detergent with a separate wash cloth and let the DonJoy MaxTrax Walker air dry. I was prescribed this boot for a fractured right fibula. I was fitted with a size large boot. I wear a women's size 9 shoe. Is a size L correct? Can I wear my MaxTrax brace outside my pants? I have a Maxtrax Walker and my work needs to know that it is a non slip surface to go back to work. Do to uh ave any information about non slip boots? Would this boot work for a frayed achellies tendon? As I am looking for something that is lite weight as the boot I have is too heavy and it is making my knee hurt and swell. This will work for Achillies injuries however it might not be lighter than what you are currenly wearing. I would suggest the XcelTrax Walker. It is made of plastic which may be lighter than the MaxTrax which has two metal bars and the base can be heavy. I have just received a walking boot from my orthopedic specialist and the day I got it it didn't do this when using the crutches with it. now when I walk with it it makes like a clicking noise from both sides where the plastic thing with angles on it is. Is this a normal thing or should I go back and have them look at it. Thank you for your questions. This product should not make any noises. I would suggest having your orthopedic take a look at it. If it is a malfunction in the product they should be able to replace it or you can call us directly if needed. I have used my boot for 2 weeks. There is a clicking noise coming from the left side of the boot where the bar attaches to the foot. Can I do something about this? If it is damaged then you should take it back to where you recieved it and get it replaced. If you purchased it on-line call BetterBraces and let them know that you have a defective boot. What is the highest patient weight limit that the MaxTrax boot is rated for? 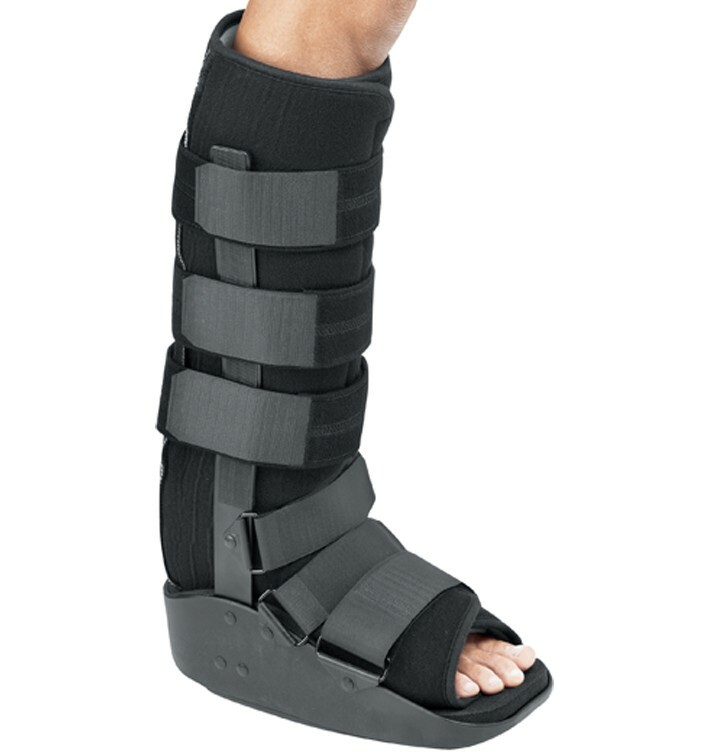 My doctor has recommended the maxtrax walker boot, but I'm unsure if it is for lower tibia fractures. I would like to ensure I can use this boot for this specific fracture before making the purchase. I know he's the expert but I thought I'd make sure. thank you for all information regarding this question. Thank you for your question. The DonJoy MaxTrax Walkers are often prescribed for post traumatic lower leg injuries, or surgery. It is not uncommon for this brace to be worn in situations like yours. a pdf of the instructions has been sent to your email. Tahnk you for your question. I was given one of your boots by my podiatrist on Monday because he believes that I have a stress fracture near my heel. I have incredibly small feet but, depending on shoe type, can wear anything from a 3.5 US in children's to a 6 in women's. I have noticed on the very back of my heel (the point of the calcaneus) I have a bright red pressure point sore (I suppose that's what it is called) that is very tender and feels bruised. Is this an issue of maybe the boot being a bit too large for me or is this an issue of maybe not having enough padding? if it is a padding issue what can you suggest that i use to prevent this from happening? We have replacement liners, but since you just starting using the boot that shouldn't be the issue. How does the brace fit? Does it feel too big? A small accomodates size 4 1/2 - 6 in womens. Please call to speak to a Product Specialist, 1-888-405-3251. I have a maxtrax for a broken right foot. I am now weighbearing and need a shoe for my healthy foot to keep my hips aligned. What is the height of the maxtrax? and any recommendations for shoes for the healthy foot? For you healthy foot, we offer a product called an "Even Up" to allow you to walk level with the foot in the walker. You should be wearing an XS (up to a size 4). If the walker is too large, you risk injury such as tripping or stumbling because the boot is too large on your foot. I am a male, US shoe size 10.5. What size boot do I need? My large works great, but I have an inch and a half or more from my toe to the boot end. Is that what you'd recommend or should I be in a medium? I'm not too picky, but am curious if standards are developed for the M/L boots. Because you are on the cusp of the Medium and Large, normally we recommend to go with the larger size. This will allow space to accomodate for people with wider feet. If you have an inch and a half of extra space at the tip of the boot, you may want to go with a medium instead. When at rest and elevated for a long period, can the boot be loosened up? That is up to your physician who is prescribing the product for you. Can the liner for the boot be washed? Handwash with mild detergent and air dry. Inhave this boot, and it works well! It is a size medium and fits fine. I was issued another brand by different Dr. For other foot in size medium, and it is horrible!! Way tight and way small, uncomfortable. I wear a size 10 in shoe. If I order this shoe you have, should I get a medium or a large? Do these boots come in left and right? The boot I am wearing seems like it's designed for a right foot, I'm wearing a left boot. Thank You. The MaxTrax Walker is made to be worn on either foot. I was prescribed a medium but wear a 11-1/2 shoe, will this be ok? For an 11 1/2 sized shoe you need to be in a Large. I have a prescription for a short walking boot (not an ankle boot). It is to stretch the tendon out. Would the DonJoy MaxTrax Walker be the one I need? Also, do you accept prescriptions? what tendon are you looking to stretchout? The MaxTrax walker is a walking boot. There are only two lengths of walking boots, standard and ankle length. If you are needing to keep the ankle in a 90 degree ankle, then yes the maxtrax is an appropriate option for you. If you are needing to look to add range of motion in the ankle then you will need the MaxTrax ROM. I have a size medium in this boot and it is too tall for me. If I were to get a size small would the shaft of the boot be shorter? Because it's too tall it doesn't allow me to keep my foot all the way down in the bottom. Thank you for visiting us at BetterBraces.com! The DonJoy MaxTrax Walker will remain the same height , regardless of size. It sounds like you may want to look at the DonJoy MaxTrax Ankle Walker. Same walker design, but available as an Ankle Walker. is the boot slip resistant? Yes. The rocker sole has a rubber grip to help eliminate slipping. I have this same boot, just wondering what the weight of the boot is. Thank you! I was recently fitted with a Medium size boot - walker, with a pump and there is a tag with the number 102309CE at the top. Can you please advise what is the weight of the boot. Can you also please advise when is the best time to use the pump feature - i.e. stage of healing. The pump is less of a "stage of healing" feature and more of a compression and stabilization feature. If your foot in the boot is all wrapped up and/or bandaged and your foot has wiggle room or spacing issues, at that time you would use the pump to inflate the liners and reduce the wiggle room in the brace. Great for lower leg stress fractures! This walking brace did exactly what it promised. I had a stress fracture in my lower leg (tibia), and it hurt to walk let alone run. Crutches were a nightmare to use so I resorted to this walking brace, and it worked perfectly. It took all the pressure off of my leg while walking comfortably and allowed the injury to heal pain-free. I highly recommend this product. I decided to try this boot after reading a review and glad i did!! The donjoy maxtrax has helped me walk without as much pain. I had a stress fracture and was on crutches for a long time, but now i am using the maxtrax which is great for me. It def has made things a little easier. It takes some getting use to walking with it on, but once you adjust the straps to your comfort level it is not bad at all. I think it is also comfortable considering it is a walking boot. I would recommend it.